This patch makes the game a Straight Character Challenge (SCC) immediately from the start of the game. 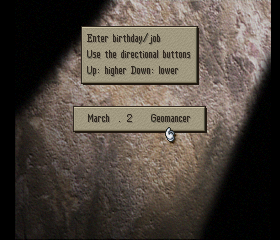 In the opening sequence, the player chooses an initial job. Your starting characters are automatically in that job (and will have appropriate equipment). 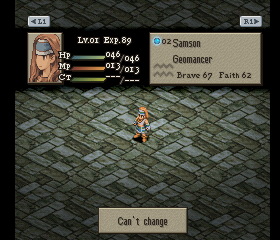 You even start the opening battle with Ramza as the SCC job. This eliminates the tedium of unlocking the job you want to play as, but also forces the player into that job earlier than normal. 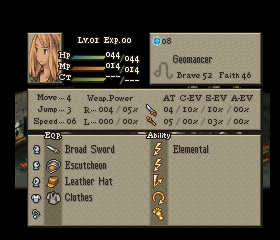 Looks like we're starting in the Geomancer Academy. And, well... you can't change jobs. This is an SCC. Also, the only selectable abilities are the ones from your job. 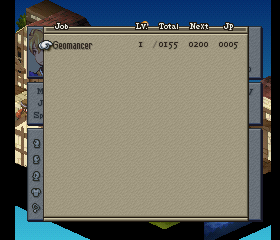 The soldier office appears to now be the Geomancer Office. Note: Soldier office prices will vary based on whatever equipment is rolled for the unit! The calculation for the hiring price is actually 1000 + (Equipment Cost). Since equipment can vary, the price will read 1000 until either Male Fighter or Female Fighter is selected (and the equipment is determined), at which point the price will update with an increased value. Characters will still join the party as normal... but will be in the SCC job, and cannot be changed out of it. This applies to special characters as well as generics! Monsters can join the party, but will not create eggs and cannot be fielded in battles. This means you actually don't have to worry about a unit going over the level limit because they just won't be able to level if they would normally have done so. Abilities to be learned from crystals only include abilities for your job. Invited units will not join the party at the end of the battle, but their equipment will silently be added to your inventory (much like what happens with a dismissed unit). This patch uses the "Random unit equipment more selective" ASM patch, and modifies the levels of some equipment so that the AI will, in general, have access to more varied equipment but not equipment that's obsolete. Start button skips events, effects, battle and event text, etc. This patch is actually completed, as far as I'm aware! The PPF is attached. I've played through on console without issue. Wow! Thats really cool, man. I cant offer much feedback as I'm a bit too whimpy for a SSC, but I will make a News post for this later tonight so more people take notice of it. Moving this to completed patches. Hello! So I tried this mod last night and I started with Samurai, but apparently none of my unit comes with a weapon. Also none of the starting city have any katana (Just finished Rat Cellar battle), and new soldier also didnt come with any weapon. So do I have to punch (literally) my way out of chapter 1 and proceed until katana available on the shop (midway chapter 2 iirc) or is this a bug? That's as expected, and standard fare for certain SCCs. The first katana doesn't become available until Chapter 2, as always. On the bright side, you should be able to punch decently hard since Samurai have good PA. I think high Brave will also help you do more punching damage. You can also rely somewhat on Guests (who have no class restrictions) in the early game. Thanks for the clarification, I will try to go through chapter 1. Blade grasp and chemist Delita should actually be enough for me to beat it. I just found this, fantastic stuff Glain! I'll have to try this out on console soon. I've been wanting to do more SCCs but the setup and cutscenes were always a turn off to do more. The start button skip feature sounds unbelievably awesome and is a game changer! To further enhance some of these I'll apply Hard Mode (Enemy abilities and JP bypass). Thank you very much for this amazing patch! I ove all of you guys who allow me to keep playing my favorite game over and over with different challenges in mind! Forgive the question, but are you going to release the level cap hack separately? That also would be cool. I was wondering about this as well. I hadn't even really thought of it, but yes, I suppose I could release the level cap functionality as a separate hack. I just put together the pieces from the SCC patch that control the level cap functionality into a single patch. I didn't really test this new patch, so let me know if it doesn't work, but I did at least test to make sure it didn't cause a crash when a unit levels up. The parts of this patch that use free space can be moved around in free space by changing the offset attributes of the relevant Location tags if there is a conflict with another hack. Each entry is a two-byte set, and it ends with 00 00. All numbers are in hex. Basically, events corresponding to certain cutscenes set this variable (Variable 0x006E) to a specific value to keep track of how far you are in the storyline. The higher the number, the further along you are. The second number in the set is the actual level cap, and that cap applies when the storyline progression variable is less than or equal to what the first number is. In our case we have four sets. # Sets v0 = 0 and experience = 99 if unit is at level cap, and skips the level up code. # Finds the level cap based on the storyline progression variable. # Sets v0 = 0 if unit is at level cap, and skips the level up code. Very nice. I know I'm going to get a great deal of use out of this. How does this affect the actual battles? 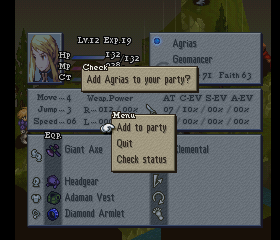 For example, in that particular instance, is Agrias a Geomancer during the actual Bariaus Valley fight or is she forced that way after? Strange change for the Rubber Shoes. It's not terribly important but it does change the fight At the Gate of Lionel Castle. Why change it? The "crits always do bonus damage" business is also a little strange to me. I'm for quality of life changes but anything that shakes the foundation of the game, even if it's only a little, makes the challenge slightly different from the original. Of course, if that was your goal, this is a solid patch through and through, and may be worth a try one day. She's a Holy Knight during the battle, and is then locked into the chosen SCC class afterwards. The general rule is that Guests will be the same as usual until they join you. I also didn't want that battle in particular to be a lot more difficult if you had chosen a less sturdy class. For that reason. The Rubber Shoes make you immune to damage from everybody in that battle except Gafgarion (and maybe the summoner?). 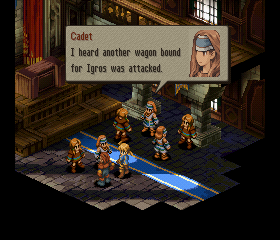 I don't think it was intended for Rubber Shoes to break the battle that badly, because the enemy units in the Lionel Gate battle are actually assigned to have random equipment, and it just so happens the game can only select the lightning weapons because of the unit levels. I understand that point of view, but I think of "crits that aren't really crits" as a bug that should be fixed. It's strange for the visual and audio effects of a crit to happen but for no bonus damage to be dealt, and I don't see why that would be desirable behavior in any circumstance.